Goodman Zissoff glass is known for its blend of modern and traditional styles and enjoyed for its wealth of colour. 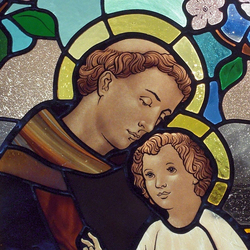 To achieve the beauty in our stained glass windows, we are committed to incorporating the finest hand blown antique glass from around the world and the highest quality craftsmanship, from designing, to fabrication, to final installation. We have executed numerous secular pieces for private residence and government commissions, including the Armed Forces in Nova Scotia and the House of Commons Parliament Buildings in Ottawa. All inquiries are received with the greatest respect to the client's wishes and input. The subject matter is thoroughly researched to ensure conveyance of beauty and content, that depicts the ultimate artistic quality. Our services also include architectural consultation, stained glass restoration and conservation. For all his contributions to stained glass in Canada, Russell C. Goodman, the founder of our studio was honoured with The Order of Canada in 1989, received The Governor General's Award 2001 and was the recipient of the Queen's Jubilee in 2002 and the Queen's Diamond Jubilee in 2012. One of our most prominent windows for 2012 was the Diamond Jubilee Stained Glass Window for the 60th Anniversary of the Queen Elizabeth II's reign. 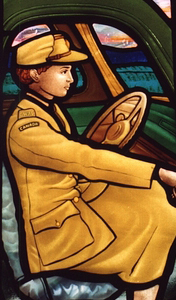 This window is housed in the main entrance to the Senate, Ottawa, Ontario. 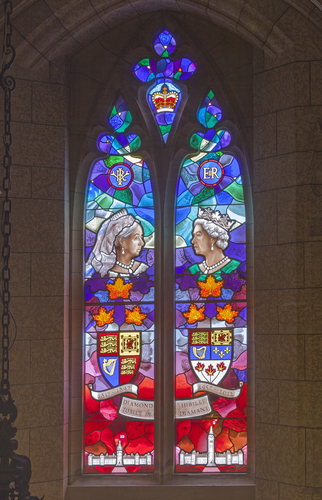 The photo of Diamond Jubilee Window at the Senate, pictured here, is copyrighted with the Government of Canada.